Day 1 is an opportunity to try-before-you-buy. Come along and meet the team. We are keen to hear about your interests in growing trees. After lunch we'll head out for farm walks highlighting local experiences. or download the Australian Master TreeGrower Course flyer. Join forest scientist and tree grower ROWAN REID from Bambra Agroforestry Farm and qualified arborist LEIGHTON STACE from Stace Tree Care for practical demonstrations, tips and discussion. This is also an opportunity to see what we're doing, planning and learning at the Mt Leura Reserve with regards to creating and monitoring hollows and nesting sites too. For more information contact Becky, or download the Making Hollows flyer. Please, feel free to help spread the word amongst your networks! A joint partnership between the Mt Leura & Mt Sugarloaf Reserves Management Committee, the Otway Agroforestry Network and Friends of Mt Leura. James Maund will guide our tour of his Frogwood arborteum and the regevetated Deans Marsh Creek. Frogwood Arboretum (est. 2007) is located on 100 acres. Previously a cattle property, Frogwood is now being transformed into an Arboretum containing some of the most remarkable tree species on the planet. When complete the Arboretum will contain over 3,000 trees selected from approximately 200 different tree species. It is intended that all the tree species planted will be Original species i.e. not cultivars. Each tree species has been selected for its outstanding beauty, its usefulness to humanity, its spiritual/symbolic meaning or a combination of these reasons. Most of the tree species will be planted in groves rather than as single specimens, showing the tree in a more natural way, and also creating a seed bank for future generations. Run in conjunction with the Australian Agroforestry Foundation. Learn about the biology and production of Shiitake mushrooms on logs, from scientists and practitioners. These workshop are very popular and place are limited, so book early to secure you place. Bookings are via the Australian Agroforestry Foundation website. Join our hosts Graham & Christina Holdaway at their innovative 150ha property which includes 120ha allocated to forestry. Biochar from forest waste - see the biochar kiln in action! 2.45: Guest Speakers: Co-founder of the Conservation Ecology Centre (CEC), Shayne Neale, and Environmental Research Manager Dr. Jack Pascoe will give an overview of the CEC's projects including establishment of over 120, 000 trees on the property and development of tree guards for wallabies, kangaroos and deer. Also koala habitat restoration programs including ecological burning techniques. After the presentation our hosts are happy to lead a drive around some of the projects. of species and have supplied restaurants and markets. Every participant will be provided with some dowels and will have the opportunity to inoculate their own log. Oak and Eucalypt will be available for purchase. Combining biodiversity with productive trees and shrubs e.g hardwood timber, honey, firewood, native/indigenous seed. Any topic of interest can be raised and discussed with Surf Coast and Inland Plains Landcare Network and Otway Agroforestry Network staff and members. As another hectic year draws to a close, take some time out to catch up with old friends and enjoy a tour of this inspiring farm, followed by a delicious afternoon tea. This is a rare treat for lovers of our bushland, native trees and native plant ecology as well as being a text book about Sheoak timber for fuel, art, craft and its role in the landscape today as well as in the past. Neville Bonney is a South Australian native plant expert, ethnobotanist and published author. He is an advocate for the commercialisation of "useful" indigenous flora and has promoted the production and development of markets for "bush foods" in Australia and beyond. We are delighted that Neville has asked us to hold his book launch here at the TreeHouse. Rowan Reid, our local agroforester, designer of the award-winning Master TreeGower program and Director of the Australian Agroforestry Foundation will officiate. So please join us. Milling a 25-yr-old planted Manna Gum (Eucalyptus viminalis) on a portable bandsaw mill, followed by a walk through a planted sawlog and managed native forest and then to an 18 yr-old plantation soon to provide high quality timber. Specifically planted trees ready for management. Regrowth on a steep slope with high quality Blackwood and Manna Gum ready for some silvicultural work (selecting, thinning and pruning). A range of good form species which could provide seed for other growers. Dean also has a band mill which he built himself so there's opportunity for a milling demonstration. Location: 231 Browns Road, Timboon. As another hectic year draws to a close, take some time out to catch up with old friends and enjoy this truly magnificnet place. After a little tree measurement activity with Rudulph, join us for a scrumptious afternoon tea. OAN Farm Walks are always a great way to see what other members are doing with their trees - plus a terrific opportunity to catch up. Three OAN members are kindly opening their gates. Starting point (map): Ravens Creek Farm SHOP. The award winning Australian Master TreeGrower is an 8-day course for farmers interested in growing and managing trees for conservation profit. Since 1996, over 100 Master TreeGrower courses have been delivered around Australia involving more than 2000 landholders. Initially developed by Rowan Reid when working at the University of Melbourne the course is now delivered across Australia and internationally by the not-for-profit Australian Agroforestry Foundation. The first day of the course is FREE (including lunch) so that you and your neighbours can come along and see what it's all about before you commit to the program (Please RSVP see Claire's details below). This course is specifically designed for farmers in the Camperdown, Timboon, Cobden, Simpson, Terang West Colac area and well supported by the Australian Government's Department of Agriculture. Each day will include morning presentations by experienced landholders, industry members and recognised experts covering topics that reflect landholder interests. Each day will be delivered in a different location allowing us to visit farms and business across the region. Program is flexible and will be adapted to suit the interests and needs of participants). Cypress decline in western Victoria is a huge issue. Hundreds of shelter belts/windbreaks across the region are dying or dead, leaving large tracts of land and livestock vulnerable to the weather. This workshop looks at why and how it occurs; can anything be done; and where to from here? Disease overview & management options: nutrient requirements for healthy Cypress; remedial action if disease is not well established; other diseases Cypress are vulnerable to; disposal of dead trees. David Smith, DEPI Entomologist and Forest Pathologist. Practical uses for dead Cypress Sawn timber - milling demonstration. Bio Char & electricity production - Dr Adrian Morphett, Earth Systems. Solutions for management and replacements: Otway Agroforestry Network team (OAN) look at the optimal benefits that integrating multipurpose trees into farming systems (ie shade, shelter, land-class subdivision; wind and water erosion control; nutrient cycling; integrated pest management amongst others) can provide as an appropriate replacement for Cypress trees. Plus shelterbelts can also give ecomomic diversity - seed, cut flowers, native food plants, Log-grown Shiitake mushrooms, timber, honey and biodiversity. Q&A: A panel including DEPI, OAN, Colac Otway Shire, CCMA, CFA and local farmers field your questions and discuss the issues about cypress removal, potential uses . . . The how, why, where & what to do about it Workshop . Cypress decline in western Victoria is a big issue. Hundreds of shelter belts/windbreaks across the region are dying or dead, leaving large tracts of land and livestock vulnerable to the weather. In response to this the Otway Agroforestry Network has teamed up with DEPI to run a series of workshops to look at why and how it occurs; can anything be done; and where to from here? Disease overview and management options including: nutrient requirements for healthy Cypress; remedial action if disease is not well established; other diseases Cypress are vulnerable to; and disposal of dead trees. 11am in the main auditorium with David Smith, DEPI Entomologist and Forest pathologist. Solutions for management and replacements: A midday session with OAN team including Rowan Reid and Andrew Stewart on the integrating of multipurpose trees into farming systems for optimal benefit (shade, shelter, land class subdivision; wind and water erosion control; nutrient cycling; integrated pest management amongst others) and as an appropriate replacement for Cypress trees. The management of trees, including shelter belt trees, for hard wood timber (silviculture) by OAN between 10.15 and 11.15am and 3pm and 4pm. Shelter belts have the potential to provide - seed, cut flowers, native food plants, Log-grown Shiitake mushrooms, timber, biodiversity and honey. A lunchtime session with Mike Edwards (OAN) on diversified products. A potential use for some Cypress - Sawn timber. Rowan Reid,OAN, and Sven-Eric Brendenberg, Swedex, will demonstrate the milling of farm-grown logs for high quality timber at 1.15pm and 4.15pm. Charcoal is another possibility for Cypress use with the potential for power and Bio char production. Bio Char for adding stable carbon back into our soils. Watch for further field days on the topic in future - including a mobile charcoal burner/electricity generator and biochar producer. Looking for some fantastic ideas about what to do on your land? Come and check out how birds, bees, biodiversity, bush tucker, banksias, furniture timber and shiitake mushrooms can solve issues such as erosion, wind, weeds, add to property value . . . provide food, fuel, timber, furniture . . . and lock up carbon. PHEW! On 10th May they invite you to join with the Barrabool Hills Landcare and the Otway Agroforestry Network to explore and enjoy all the possiblities that integrating trees and shrubs can bring. Food: soups, sandwiches, local wines and beers bush flavoured ice creams, coffee (of course!). This is a working farm - please no dogs! As a follow up to our very successful June Seed Collection Workshop, OAN is hosting a Propagation Workshop at Otway Greening Nursery. Participants will prick out their own plants as well as sow their own native seed. The workshop has limited spaces so first come best dressed. To register for the workshop contact: Claire Dennis: e: claire.dennis@oan.org.au or m: 0488 362 850. Goldenseal (Hydrastis canadensis), also called orangeroot or yellow puccoon, is a perennial herb in the buttercup family Ranunculaceae, native to southeastern Canada and the northeastern United States. Goldenseal is one of the most popular herbs sold on the American market. Its numerous uses are attributed to its antibiotic, anti-inflammatory and astringent properties. Tony has been growing Goldenseal in Victoria since 1996 and has harvest the valuable root crop and sold some back to the USA. Many family farmers grow Goldenseal under their Oak trees and the Otway Agroforestry Network is exploring its potential as a commercial under storey for agroforestry in our region. Tony also grows and researches other understorey herbs such as Black Cohosh and Bearberry. He will talk about these and other potential crops. This is your chance to involved in an exciting new industry. Tony will present his experience and research with a classroom seminar, follwed by a practical planting exercise (3-4 hours). Those interested are welcome to stay on for a short tour of the Bambra Agroforestry Farm. In May this year a seven-member team from OAN visited Kabale, Uganda to deliver the first African Master TreeGrower course. It was an amazing experience and the resounding success of the course exceeded everyones' expectations. It also resulted in the formation of the Kabale Agroforestry Network. The team will present an informative and often humorous account of the trip and the course. Plus: Gorillas in the mist, the eccentric Cephas Inn, Tsetse flies on the Nile, and doing a radio interview in the native language that broadcast to 8 million people in 4 different countries! Everyone is welcome to join us for the evening. Entry will be a small donation of $5 to go to the newly formed Kabale Agroforestry Network fund. The workshop is designed ot be fun, hands on, will take place out in the fields and because there is plenty of lead time before the day, the location of the workshop will depend on the interests of the particpants. What is a seed? When is it ripe? To register your interest contact: Claire Dennis: e: claire.dennis@oan.org.au or m: 0488 362 850. Celebrating 20 years of OAN: Made the seachange/treechange? Looking for fantastic ideas about what to do with your land? Come and check out how truffles, shiitake mushrooms, furniture timber, birds, banksias, bees, bush tucker will solve issues such as erosion, wind, salt, weeds . . . and make you and your piece of heaven feel good too! Rob and Anna made the change more than 10 years ago. He bought a fabulous view and lucky for him the previous owner had started planting an agroforest to help protect and shelter the hillsides from the howling wind off Bass Strait. Rob has expanded this to include many more tree plantings for shelter, furniture timber and aesthetics with a wide rage of species including oaks. Rob supplies thinnings of wattle for english style fencing (displayed on the day) Rob's passion has turned into an award winning business too - Otway Forest Shiitake. Chef Steve and partner Miki made the change too. Going back to Steve's farming roots, they have a very successful truffery, produce ethically raised lamb and beef, grow a range of herbs on their 36ha farm for their La Bimba Restaurant. Their passion is to have more control over the food they serve, they also supply surplus product to the restaurant trade and plan to establish a gate for the public. Where: Wongarra. Take the Great Ocean Road at Wongarra and head up Sunnyside Road. Approx 6kms turn right into Kenneady's Road - Rob is #50. Steve's place is #415 Sunnyside Road, approx 1km back the way you came - opp Beatty Lane. Look out for field day signs. Mike & Mandy downsized from their sheep and tree farm at Lavers Hill 12 year ago to the more gentler climes of Barongarook. Come and see what can be achieved on a small holding in a short time frame: bush food plants, banksias and other native flowers, timber trees and sheep. A very productive little haven. Commencing with lunch, we will then check out what an energetic dairy farming family have achieved in their quest to be more sustainable and productive. They are transforming their landscape into something that is not only more profitable, but a happier environment for them and their cows. Come and see the inspiring work Fiona & David Stephens are doing at their property near Shelford. They are strategically placing more timber and indigenous plants into their agricultural system to: protect the biophysical resources of the property; provide a more resilient system able to cope with climate variability and change; shelter pasture and crops for maximum production and reduce wind erosion; provide parasitic insects for pasture and crop pests; cycle nutrients from deeper soil profiles; increase aethetics; and produce a range of potential diversified products in the form of timber, native food plants products, tree and shrub seed and honey. After good walk we'll be ready for a festive BBQ! f you can't make the walk, it's OK to just come for the evening - we'd love to catch up with you. It will be a relaxing way to share and celebrate a great year. The Otway Agroforestry Network's Farm Tree Expo 2012 highlights the diverse products and benefits agroforestry in our landscape has to offer. Sustainable and diversified agriculture can lead to greater efficiency AND reduce greenhouse gases. More . . .
A feast for the senses, combining both botanical and indigenous art with the wonderful flavours of Australian native plants, including cooking demonstrations by native food chef and champion Andrew Fielke. The Art of Native Food will be presented by the Australian Native Food Industry Ltd. to showcase the amazing native produce that we can grow, value add and market in Australia. The art exhibition will feature twelve of the most popular native plant foods in a botanical art style and a variety of native food representations in indigenous art. The contrast in artistic styles aims to draw attention to Australian native produce and its potential not only as a gourmet food product but in everyday cooking as well. The art exhibition will be an exquisite backdrop to cooking demonstrations by renowned native food chef and champion Andrew Fielke, plus tastings of products that include native Australian flavours. This will be an opportunity to learn about the growing range of products that now feature Australian native foods, how many Australian native flavours can be used in flavouring everyday dishes as well as seeing some of the gourmet creations that Australian native food products are known for. .
12pm CFA Fire Ready presentation with a focus on Personal Risk and Planning. 1.30pm A demonstration of fire behaviour in different landscapes with a focus onvegetation or Agroforestry design features to minimise risk. OAN draft quality standards for firewood. 1.00pm Guest speaker - Greg Parker-Hill from Australian Home Heating Association will talk about Low Carbon Heaters and Carbon Zero living. Shade and shelter provide microclimates in hot & cold conditions allowing stock, pastures and crops to be more productive. Presented by Rowan Reid, Agroforestry Consultant and Lecturer in the Master of Forest Science, Melbourne University. RSVP for catering by 21st June. The Otway Agroforestry Network's Farm Tree Expo 2011 highlights the diverse products and benefits agroforestry in our landscape has to offer. Sustainable and diversified agriculture can lead to greater efficiency AND reduce greenhouse gases. Come and see demonstrations of tree establishment options, pruning equipment, harvesting machinery, chainsaws, portable sawmills and firewood machines. Browse displays of forest products such as bees, honey, bush foods, cut-flowers, seed production, woodcrafts, musical instruments, Log-grown Shiitake mushrooms and high-quality furniture made from farm grown trees. Visitors will have direct access to local and national experts on all aspects of tree growing. This is also the chance to meet some of the region's leading tree growers and hear their stories. Visit the TreeHouse Gallery at 55 Main Street Birregurra and see fabulous hand crafted furniture and sculptures. Make a day or weekend of it and enjoy Birregurra and the surrounding Otways, where we work towards a more sustainable and healthy environment for all. 10.00am ~ Welcome and launch of OAN's latest Caring for our Country project by Federal Member for Corangamite, Darren Cheeseman. Andrew Stewart, Deans Marsh farmer/agroforester and co-ordinator of OAN, will talk about the number of bird species that have been identified on his property since establishing Agroforestry. 106 species and still counting! Guest Speaker ~ Professor Andrew Bennett, School of Life and Environmental Sciences, Deakin University will speak about agroforestry in support of landscape-scale bird life. Andrew is an engaging speaker and is passionate about ecology, Australian wildlife and landscape. 12.30 An OAN Lunch ~ always fabulous! Are you a net sequester, a net emitter or a greenhouse gas neutral farm? Could you change your status with minor adjustments to your farming operation? Could you generate some extra dollars from sequestering someone else's greenhouse gas emissions? John Marriott, a whole farm planning consultant, has worked out a relatively simple way of calculating greenhouse gasses based on farm expenditure, and will attempt to answer these questions. Patterns of landuse on your farm~ Ha used for grazing, Ha used for cropping, Ha under remnant vegetation, revegetated area of land etc. The number of livestock you have on the property and their age break down. Fuel usage on the farm based on annual expenditure. e.g. $ spent in a year on gas, electricity, diesel and petrol. Nitrogen fertiliser use and costs in a year and its form e.g. urea, sulphate of ammonia. This does not have to be 100% accurate the goal is to see what adjustments will move the farm to a Greenhouse gas neutral or net sequestration situation. 3.00pm Guest Speaker Alistair McKendrick, fine-furniture maker. Alistair has pieces at the TreeHouse Gallery, Birregurra, including a beautiful contempary hall table made from Rowan Reid's 17 year-old Shining Gum. Looking at the Climate Variability and Influencers in more detail than the first workshop held on 29th May, which are: El Nino, La Nina, the Indian Ocean Dipole (Temperature differences in the Indian Ocean), the Sub Tropical Ridge (Sub Tropical High Pressure system), and The Southern Annular Mode (Antarctic systems which influence winter cold fronts). Also we will consider current climatic trends in SW Vic and how the influencers are impacting on these trends. DPI research into farmer perceptions of, and adaptations to, climatic variability and change in SW Vic. Tools for tracking influencers and predicting potential rainfall and temperature in coming seasons. Effective ways of communicating what influences climate in SW Vic. Climatic variability and even unpredictability is an issue farmers have had to deal with since European settlement. We measure climate in averages e.g. average rainfall. However annual rainfall may vary considerably from year to year, e.g. Average rainfall for an area may be 700mm actual annual rainfall can vary from 1200mm to 550mm, and is impacted by El Nino, La Nina, the Southern Oscillation Index, Antarctic currents and the Indian Ocean Dipole. Can we predict what will happen in the next season by tracking the above influencers and how will an overall temperature increase impact on them? These questions will be discussed at a seminar as part of the Otway Agroforestry Network's Farm Tree Expo 2010 on 29th May, 1pm at the Birregurra Community Health Centre, Strachan Street, Birregurra by Graeme Anderson, Senior Subject Specialist - Climate. Graeme works in the Farm Services Victoria section of the Department of Primary Industries. This is the first in a series seminars funded by the Federal Government's Farm Ready Program. The Otway Agroforestry Network's Farm Tree Expo 2010 is a celebration of everything trees and shrubs have to offer farmers of all types. Come and see demonstrations of tree establishment options, pruning equipment, harvesting machinery, chainsaws and portable sawmills. Find out about the Climatic influencers in South West Victoria. Learn how to track El Nino, La Ninya, the Southern Oscillation Indes, Antarctic current and the Indian Ocean. A special seminar will be led by climate experts and looks at variability and what influences it. Opening of the new OAN office and TreeHouse Gallery at 55 Main Street Birregurra. A lot of you have probably been hearing the 'buzz' about the disappearing bees around the planet. Australia is one of the few continents where bees are still thriving. Bees are a critical forest product needed for the pollination of many other food crops and may be needed to boost stocks in other parts of the world. Why not include them in your plantings? To find out more, join us for a 'walk and talk' at George Howson's property, with guest bee guru David Martin from the DPI. We will also view George's agroforestry plantings of Wattle (Silver and Black) along with Sydney Blue Gum, Spotted Gum and Southern Mahogany plus a Mountain Pepper trial. George is also growing organic garlic. Free to members, $10 for non-members and of course a smashing arvo tea included. A project of The Otway Agroforestry Network and The Australian Master TreeGrowers. We are offering you the opportunity to participate in a one-day workshop covering all aspects of the small scale production of Shiitake mushrooms on logs. Two workshops will be run in October 2009. Participants will receive production notes and sufficient spawn to inoculate about 5 logs for home use. You will only have time to inoculate 2 or 3 logs during the workshop. Additional spawn and logs will be available to purchase for those who attend. Due to import restrictions and project funding we are unable to sell spawn to people who do not attend the workshops. It is anticipated that further workshops will be conducted in 2010 and possibly in other states. * As part of our import licences and government funding all recipients of the starter pack are required to be members of the Otway Agroforestry Network (or other agroforestry networks). 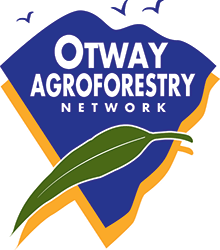 The Otway Agroforestry Network (OAN) is a not-for-profit community organization striving to encourage the wider adoption of vegetation management as an integral component of productive and environmentally sustainable agriculture. Membership is open to all. You will receive our newsletters and 3 copies of the full-colour Australian Agroforestry national magazine per year. You will also become a member of our Shiitake Growers Group and be able to receive follow up shiitake support.